The NCAA’s football rules committee on Wednesday issued a proposal that would guarantee defenses a 10-second window to substitute prior to offensive plays. According to Troy Calhoun, the head coach at the Air Force and chair of the committee, the objective of the measure would be promoting player safety. This is a laudable goal. On some intuitive level, the proposal at least sounds like a common-sense approach to achieving it. And if you read it closely enough, you can almost hear Nick Saban dictating the release to the committee. Alabama’s coach, of course, has publicly lamented the growth of uptempo offenses in college football, voicing – wait for it – concerns about the health risks to his players. His campaign in the press against the no-huddle offense even gave us his own “can’t we all just get along?” moment. In the aftermath of the committee’s announcement, the overall reaction appeared decidedly negative. Why? For starters, there doesn't appear to be much solid evidence that the no-huddle offense has led to more injuries. To the contrary, research done by Dave Bartoo of CFBMatrix.com indicates that teams that play slow actually have a higher incidence of injuries than uptempo teams. I suspect, though, that some of the most ardent detractors view the rule as a diabolical plan to tilt the playing field back in favor of Manball purists such as Saban and Arkansas’ Bret Bielema. Note that the two FBS head coaches on the rules committee, Calhoun and Louisiana-Monroe’s Todd Berry, are far from speed demons – their teams ranked 106th and 84th nationally in total plays run in 2013, according to cfbstats.com. To me, this raises an interesting question: Would the peanut gallery have been more receptive initially to this idea if Saban hadn’t raised a ruckus about it previously? Saban, the most prominent coach in the sport, started voicing his displeasure right around the time that it became apparent no-huddle offenses represent the closest approximation in existence to Kryptonite for his super defensive schemes. In that context, it was easy to ascribe Saban’s supposed concerns about player safety to an effort to rebalance the playing field. Pretty familiar story, really: Innovators threaten the power structure, so the Big Swinging Dicks want to rewrite the rules. If Saban had never said a word about tempo, I suspect this proposal would still meet its likely fate. Essentially, his bitching just sped up an informal vetting process that would have taken place either way. A Pac-12 coordinator on 10-second proposal: "Won't pass. NCAA likes offense." Yet, from a macro standpoint, I worry that the instantaneous backlash against the proposal reflects a larger issue with how the shot callers in college athletics make their sausage. As is the case with any legislative endeavor, the NCAA rulemaking process is subject to lobbying by vested interests. Dressing up your own goals in altruistic clothing is par for the course. 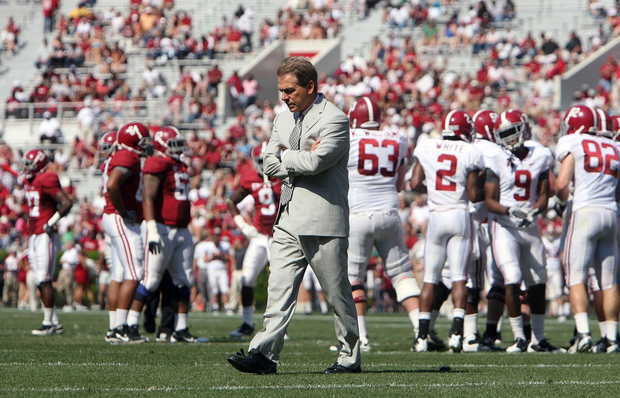 In that respect, a ruthless competitor such as Saban pushing for a change for the good of the game should tweak any right-thinking observer's antennae. In this case, however, you’ve got the issue of player safety being batted around like a political football. I’d hope that we could at least count on the people in charge to put that above this pathetic obsession with rigging the game. Even more than that, though, I hope we don’t reach a point where we’re so jaded by all these machinations that it gums up the capacity to implement reforms that do promote player safety in a meaningful way. Making college athletics safer when possible should be an end in and of itself, not a means to winning more games.